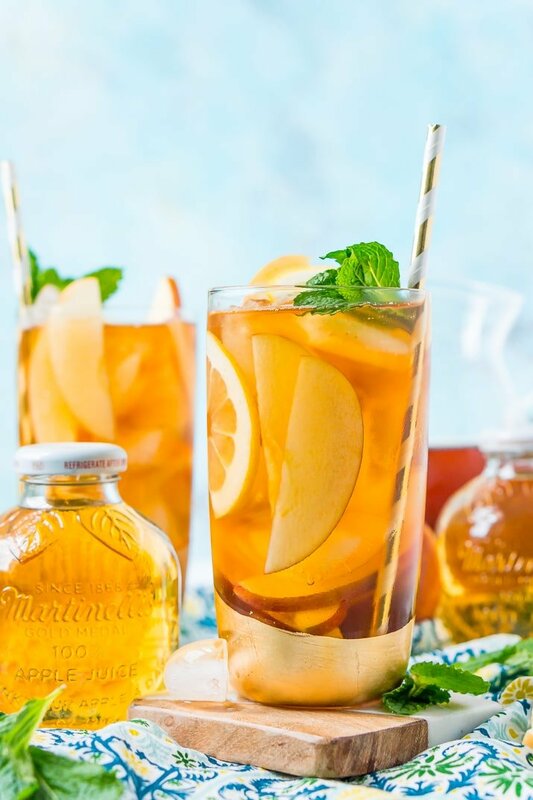 This Apple Iced Tea recipe is sponsored by Martinelli’s, all opinions are my own. 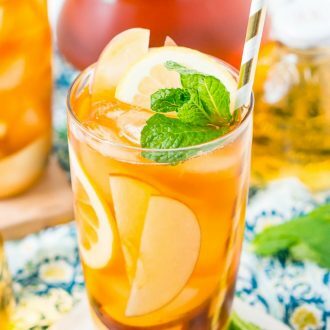 This Apple Iced Tea is made with freshly brewed black tea, sweet apple juice, fresh apple slices, and a squeeze of lemon for a refreshing summer drink that’s easy to make. I love drinking iced tea all summer long, and now that the season is finally (almost!) here, it’s time to get stirring! In order to keep this classic beverage interesting, I decided to add a fruity twist by concocting a recipe for homemade Apple Iced Tea. It’s important to stay hydrated when the sun is blazing, but sometimes, water just doesn’t cut it. That’s why I love having a stash of easy, delicious, and thirst-quenching drink recipes on hand when the weather gets hot – and this is my new favorite! Apple Iced Tea combines brewed black tea with a splash of naturally sweet apple juice and tart apple slices. It has a touch of sweetness, a kick of caffeine, and it’s super refreshing. The secret to capturing the crisp taste of fresh apples is all in the juice. Brands that use high fructose syrup, additives, or preservatives simply won’t do, and that’s why I always opt for the fresh-pressed flavor of Martinelli’s 100% pure apple juice. With a century and a half of experience, it’s no wonder that Martinelli’s has perfected its craft. The difference with this company is in the process: they hand-sort their apples, which are then fresh pressed, bottled, flash-pasteurized and quickly cooled to seal in that fresh-picked taste. Of course, each bottle contains 100% juice, and never any additives or preservatives. 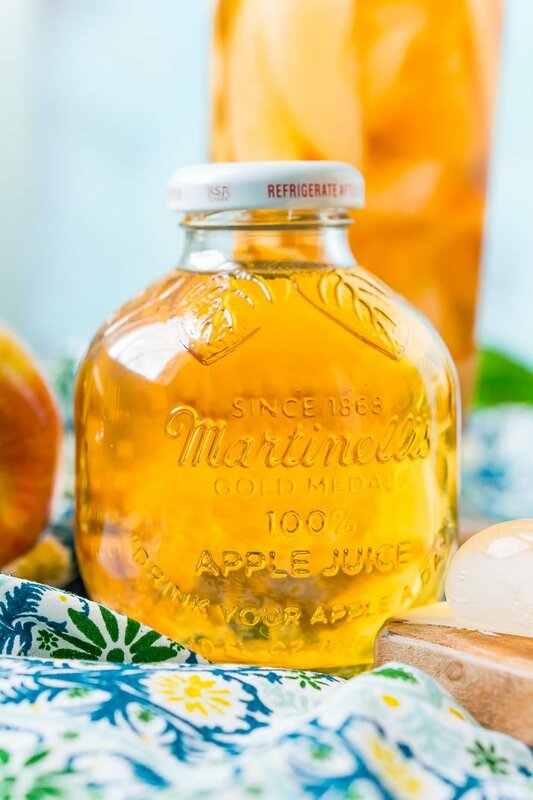 Once you try Martinelli’s, it’s the only apple juice you’ll ever want to drink! So, it’s really no wonder that my favorite apple juice is the star ingredient in my Apple Iced Tea recipe. The not-too-sweet flavor will quench your thirst on a hot day, plus the infusion from the apple slices kicks the fruitiness up a notch! 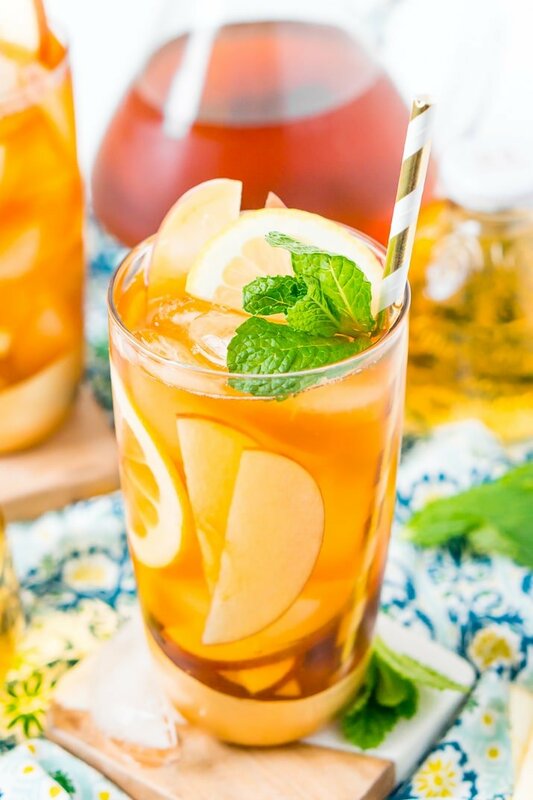 Apple Iced Tea is the perfect pick-me-up to enjoy with a midday snack. It provides just enough caffeine to stave off that late afternoon sleepiness, plus it’s really delicious when paired with a homemade treat, like a slice of Banana Bread or a Strawberry Scone! You can go ahead and get addicted to this sippable drink because it’s so easy to make. I like brewing a big batch of black tea and keeping it in the fridge, then just mixing up my Apple Iced Tea by the glass. I love the Martinelli’s 10 oz. bottles for making up single drinks, but you can also mix this up in a big pitcher for a summer party! After all, it’s a lot healthier than soda or punch, but it’s much more exciting than boring old water! Throughout the warm weather months I plan on mixing up several pitchers of Apple Iced Tea to serve at cookouts. It’s perfect alongside burgers, hot dogs, potato salad, and all the fixings, plus what’s more all-American than a recipe made with apples?! 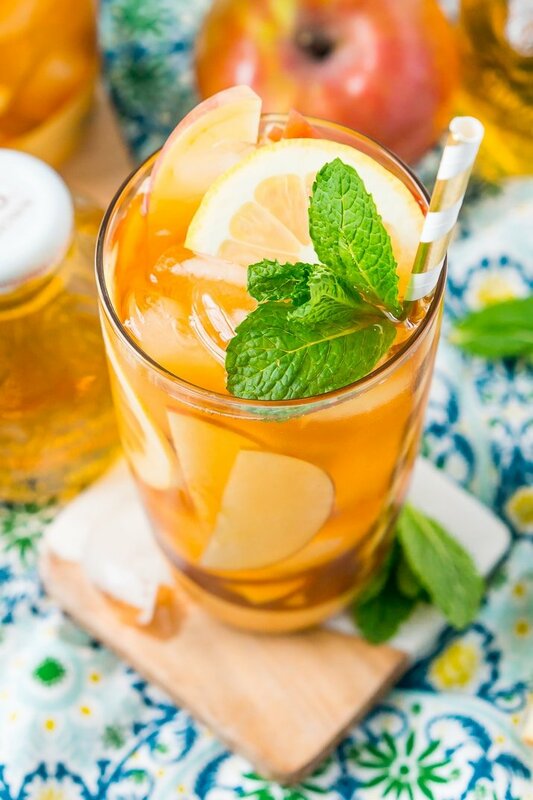 Stir up a glass of delicious and refreshing Apple Iced Tea when the temperatures start to soar this summer. And don’t forget: the secret ingredient is Martinelli’s pure and fresh tasting apple juice! You can use whatever black tea you’d like, although I would recommend a classic blend that lets the apple juice be the star. You can brew your tea with hot water or as sun tea, but make sure to chill it or at least bring it to room temperature before mixing with the other ingredients. If you’re crunched for time, you can also purchase your favorite bottled unsweetened iced tea to use. 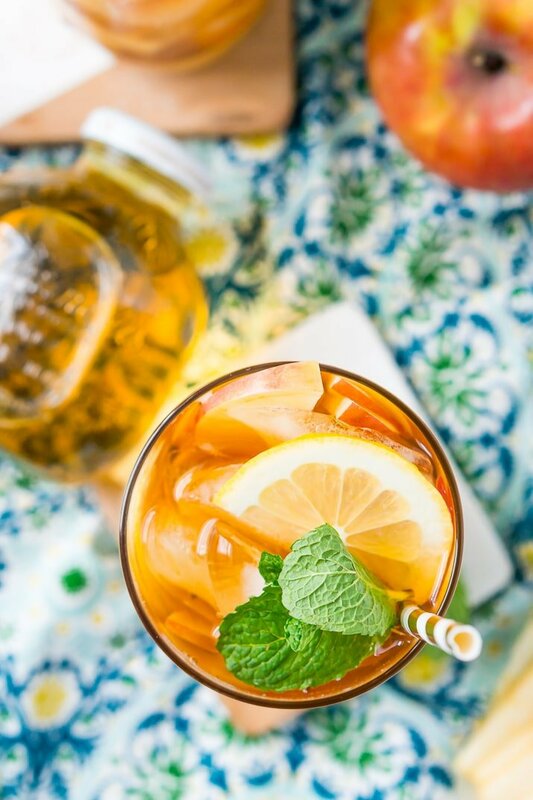 Pin this Apple Iced Tea for Later! 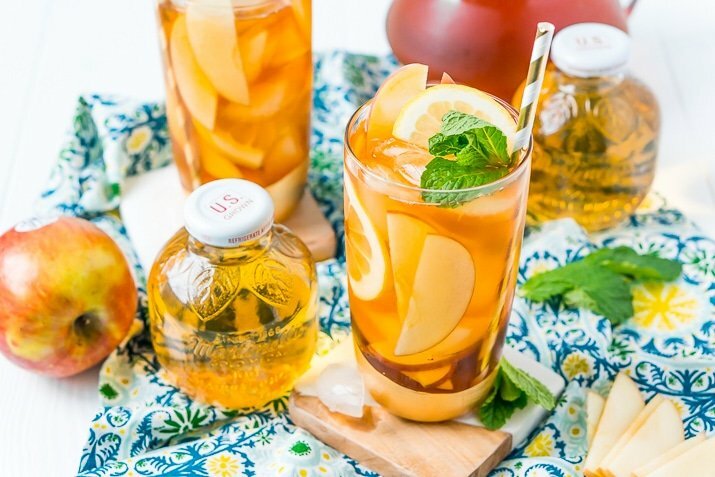 This Apple Iced Tea is made with freshly brewed black tea, sweet apple juice, fresh apple slices, and a squeeze of lemon for a refreshing summer drink that's easy to make. Add tea, apple juice, ice, and apple slices to a tall glass and stir to blend. Garnish with lemon slices and mint sprigs if desired. For large batches for big gatherings, simply combine tea and juice at a 3:1 ratio. This is so unique! I probably couldn’t stop drinking these, I adore anything apple. Iced tea is my go-to drink during summer. I love the flavor of this one! Can’t wait to try it! 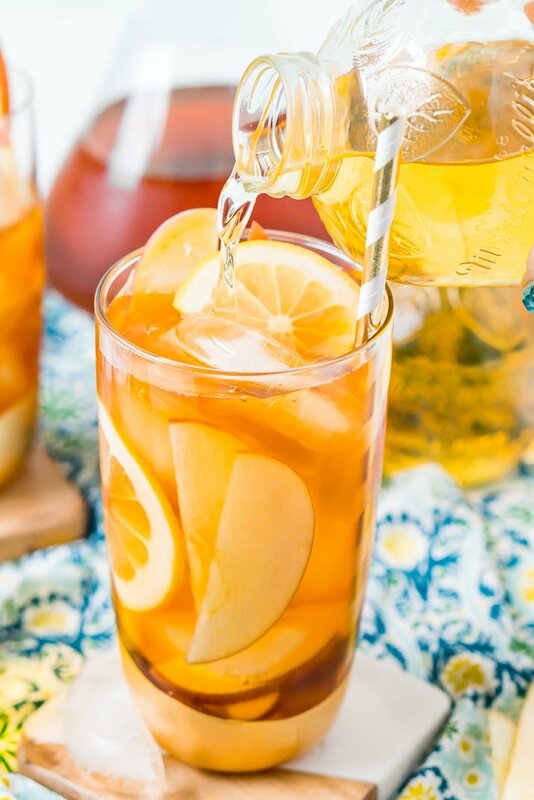 We love Iced Tea in the summer, and this looks amazing. Making it this weekend. Thanks for the recipe.